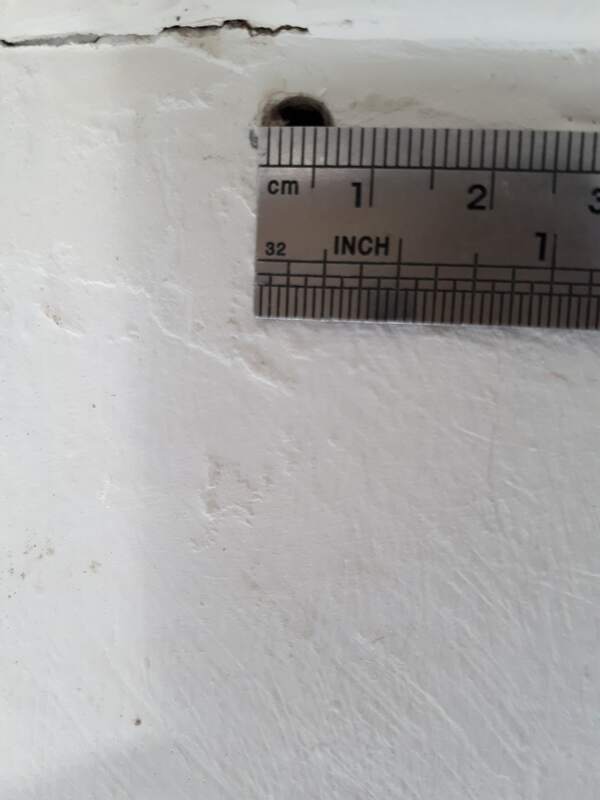 How to fit a screw into a drilled big hole on wall? I am fitting a window blind on a wall. The wall is made of plaster board as far as I have known. I have drilled a hole on wall bigger than the screw size. 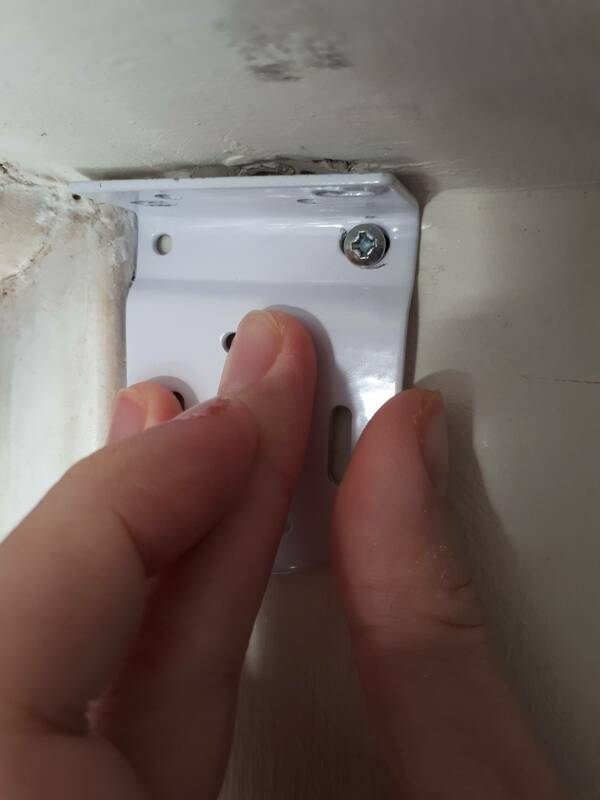 How do I fit the screw tightly and safely on the large drilled hole on wall? For this you can use wall drilling anchors as shown in the images below. They are also known as wall plugs or rawl plugs. You can get them from any hardware shop. If there is no wood at all behind this spot anywhere, a plain wall anchor may rip out over time - curtain rails hold curtains which can be heavy, and can flap around in the wind creating vibration which slowly erodes plaster. Rightmost is your standard cheap wall insert. It is supposed to flange out as the screw goes through the middle. Avoid where possible. Second from right is a plastic toggle. These are pretty good because the two bits on the side fold and press against the inside of the plaster board. Ideally they should be sized for the thickness of your board. Middle shows the large-radius coarse thread variant of the first one. These are astonishingly good. For double the radius you're getting at least four times the holding power. Second from left is the toggle bolt. It needs a slightly bigger hole for the legs to go through, but when expanded inside the wall (as pictured, its got a spring) then there's a heap of holding area. Can hold medium sized mirrors. Leftmost is a "mollybolt" and is an older design, harder to find. This one has four legs which fold out inside the wall when the screw is tightened. Note they do not adust for thickness - you need to size them for the thickness of the wallboard you're using. The pictured one is probably for half to 3/4 inch depth. A 1/4 inch or 6mm thick wallboard would have less shank on it. Not pictured are the super-cheap tube ones that come with many cheap goods like smoke detectors. Not worth it at all. Note, once installed, none of these plugs are going to come out without leaving a large hole. Your other option is to plate the area under the curtain rail with some solid wood as reinforcement. 10mm thick would be a minimum IMO. Screw that to the studs where they cross, and then you can hang the curtain rail hooks whereever you need them. As strange as this might sound, provided there's a stud back there, you can use toothpicks to fill in the hole. The toothpicks can bite into the screw, and provide friction against the surrounding wood. But if there is solid wood of sufficient dimensions behind the plaster you use a long enough screw to thread into the wood. In your case, if you have good wood behind the plaster, but you have drilled too large a hole for the screw, just use a long enough anchor to fit an inch or more into the wood and thread in the screw. The anchor will expand as the screw goes in and will grip the sides of the hole in the wood. For oversized holes in wood, lightly tap in a glue coated dowel and redrill the screw hole. This may require widening the hole to the next available dowel size. For holes in un-backed drywall, use an anchor. (Your hardware store will have various kinds, but the simple plastic ones usually work fine for light loads.) If the particular hole in question try inserting an anchor first. If it has wood behind it that prevents use of an anchor, use the dowel and cut it flush to the drywall surface. Fill in any gaps between the dowel and the drywall with spackling, drywall mud or other filler recommended by your hardware store. Instead of a dowel you could squirt some wood glue in hole and put wooded toothpicks in until you can't fit anymore. Wait a few hours and break off the toothpicks flush with the drywall. You should be able to use the original screw. I am a finish carpenter and have done this before. You can close up the big hole with some putty, and screw your screw after it dries. It is always recommended to use a plastic anchor for better wall grip. Drill an 8mm hole in the bracket and use a 7 mm screw into the 6mm hole. Drill another hole in the bracket that is about a centimeter or so away from the original hole and insert a screw through that hole. Generally, the hole in the bracket should be 1 or 2 mm larger than the diameter of the screw. If your hole is too large to take a wall plug or anchor, then your best solution is to fill the hole with filler (e.g. Polyfilla), leave it to fully harden, and then redrill the hole to the correct size. You don't need to worry too much about filling the hole perfectly flush - it'll be covered by the plate anyway. Looking at your hole though, I suspect you may just want a larger diameter. 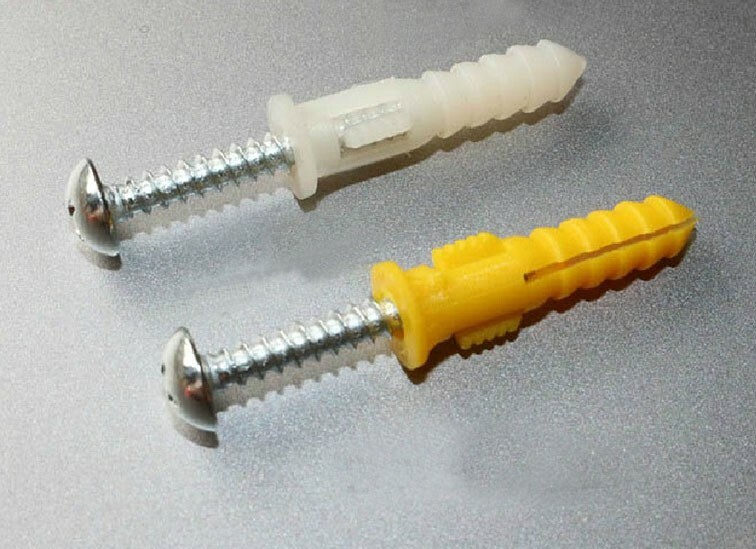 Note that all screws into plasterboard/drywall should use some kind of appropriate wall plug or anchor for plasterboard. Contrary to spurious claims by some screw manufacturers, it is not possible to securely fasten a screw directly into plasterboard. The point loads on the screw thread will always weaken the plasterboard, and the fixing will inevitably pull loose after not very long. This is particularly going to be an issue for your blind - you don't want it falling off! Here's a technique I learned from a my uncle who's 80 years old. Find a a piece of wood that could be hammered into the hole. hammer it and break the the part that's sticking out. Done, time to drill the screw to the hole. Not the answer you're looking for? Browse other questions tagged screws drill blinds or ask your own question. How can I screw a small threaded rod in a bigger hole? Unable to drill into window lintel - what have I got wrong? Hanging faux wood blinds- screw broken. Is there a tough screw I can use for a wall stud? What screws to affix TV mount to wooden stud partition? Would a M6 bolt fit in a 6mm hole?